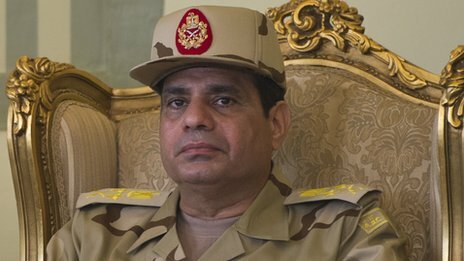 THIS MAN, GENERAL ABDEL FATTAH EL-SISI IS WANTED FOR TREASON, OVERTHROWING A DEMOCRATICALLY ELECTED GOVERNMENT AND FOR ORCHESTRATING THE KILLING OF AT LEAST ONE THOUSAND EGYPTIANS. WILL WE ONE DAY, WITNESS HIS OPEN AND FAIR TRIAL IN TAHRIR SQUARE? Too many Taliban without beards around. On blogs, twitter, etc. They should come clean. Nobody is stopping them from going home. Just don't be an extremist in your adopted country.